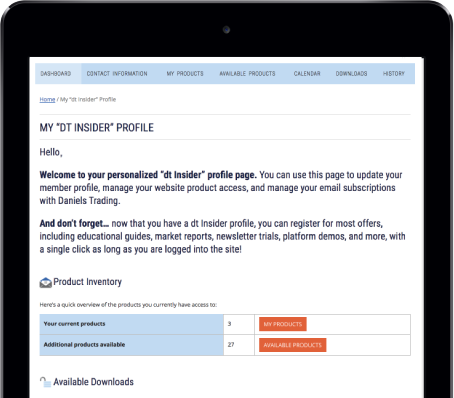 When you create a free DT Insider account profile, you’ll have access to webinars, educational guides, exclusive reports, newsletters, and more. Our trading software, DT Pro, is an easy-to-use application that handles all of the complexities associated with trading and order management. We’re dedicated to satisfying the needs of active traders by offering this premier trading platform. Instantly gain insight into the most exciting market movers with tools such as the Market Action Scanner. The Daniels Trading Market Action Scanner allows you to leverage powerful proprietary algorithms derived from Market Profile analysis. Our futures brokers serve as advocates who are in tune to each client's specific trading needs and objectives. The brokers at Daniels Trading are here to guide you, answer questions, address concerns, and manage your orders.